The main category view in the DiskSorter GUI application shows file classification results according to the logical hierarchy of file categories and classes as defined in the selected file classification plug-in. 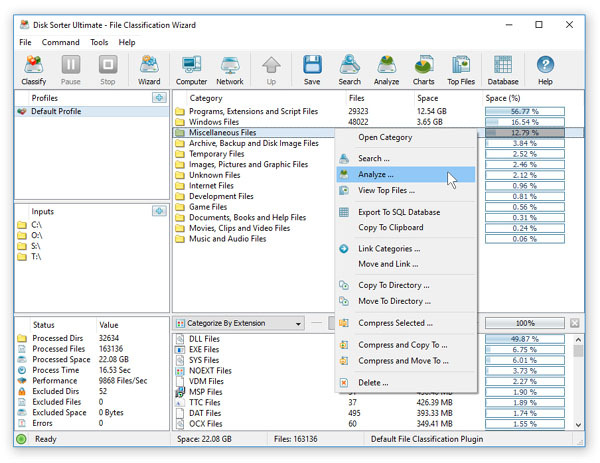 In addition, the DiskSorter file classification utility provides the ability to analyze file classification results and show were files related to one or more file categories are physically located in the disk and then display a hierarchy of directories and files sorted by the amount of the used disk space. Moreover, such an analysis may be performed on filtered file classification results showing files matching multiple user-defined criteria. For example, in order to see where are located all documents that were last modified more then X months ago, apply an appropriate modification time file filter, select the 'Documents' file category, press the right mouse button and select the 'Analyze' menu item. 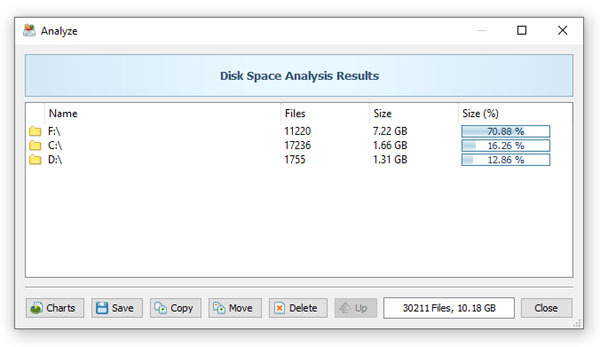 The analysis results dialog shows a hierarchy of directories and files sorted by the amount of the used storage space. The user is provided with the ability to perform numerous file management operations including file copy, move and delete. In addition, DiskSorter allows one to export the analysis results to the HTML, PDF, Excel CSV, text and XML formats.